place of a ruff is tightly pleated and edged with pearls (okok, they’re fake). a necklace under it, but it is completely invisible in this picture. faceted red “jewels” and five with large oval “pearls”. 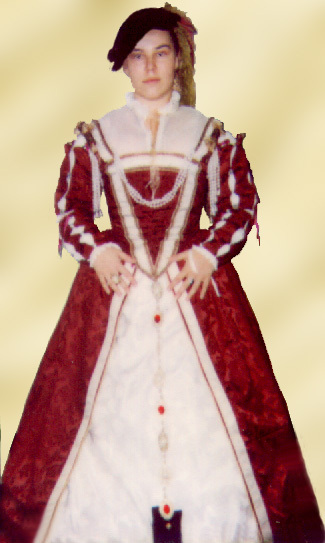 wearing loop behind the bodice (where the sleeves tie in), and dangle. gold/red trim from the bodice, but that doesn’t show here. construction problems, as I found out. First of all, the skirt is not flatlined. at that. (I measured for it in a fit of optimism after a two week stomach flu. I was very hungry and those measurements quickly became obsolete. So it goes.